– tell the Township and the Board of Commissioners that the Trail is important to you. Simple instructions to join or contribute are under the “Membership” tab. Your contribution supports our work and lets you be counted as a true Friend of a beautiful area. In the construction and maintenance of the Cynwyd Heritage Trail, the Township counts on the Friends and we count on the volunteers. 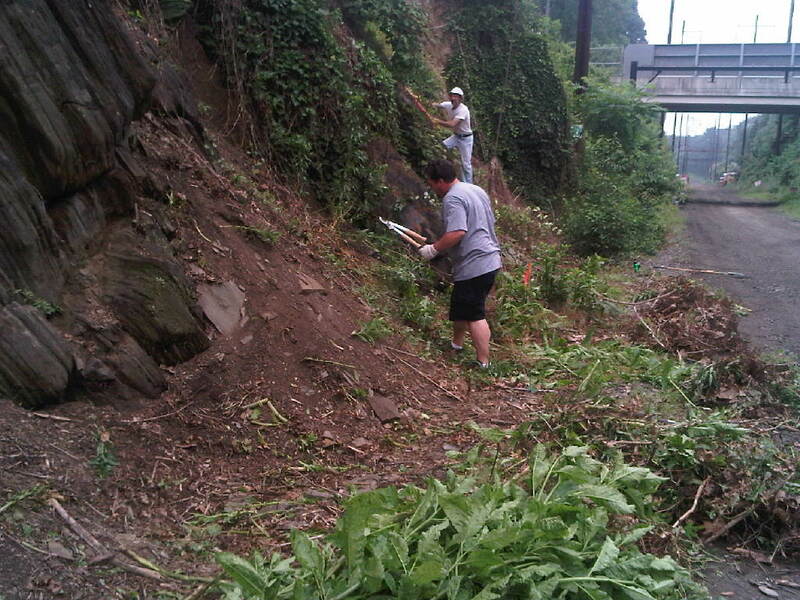 Since 2008, Friends volunteers have made significant progress in clearing debris and invasive plants. Volunteer work weekends are once per month, and we also meet after work hours on certain workdays (see our Calendar). If you want to work on the Trail, a Volunteer Waiver Application is required. You can either print this version or submit an electronic waiver. But that’s not all volunteers can do. We also require expertise in event planning, public communications, and area businesses and government rapport to facilitate the Trail’s ongoing development. If you are interested in opportunities like these, please e-mail us and we’ll contact you as the needs arise. If you want to get involved in governance or just see some of the inner workings of how the Trail operates, our monthly board meetings are open to the public. See the “Events” tab for information on meeting dates, times, and location. Does your company want to volunteer with the Friends during the week? The Friends of Cynwyd Heritage Trail is now providing this services to local companies. We can accommodate up to 50 adults with proper notice. We can help you and your company put together a project (or projects) that will benefit your employee group, your company and our community all at the same time. For more information regarding volunteer opportunities, contact the Friends at info@cynwydtrail.org. We have many opportunities for you to volunteer to help protect, enhance, restore, and preserve our natural resources. Volunteers of all ages and skill levels are invited to join us on fun, rewarding outdoor stewardship projects. Help plant trees, remove invasive weeds, pick up trash and debris, as well as maintain and construct trails. Ready to get outside and volunteer? If you or your organization would like to explore upcoming projects,and learn about volunteering outdoors, please contact us at info@cynwydtrail.org or contact Chris Leswing, (Assistant Director, Building and Planning, Planning Supervisor) at CLeswing@lowermerion.org. 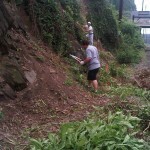 Lower Merion Township sponsors the Trail Workdays. You may contact Chris Leswing or call 610.645.6116 for more information. Workdays are usually held on Saturdays beginning at 8:30a (exact locations are announced as the dates near). We provide the tools, supplies, and refreshments for volunteers. Come out and enjoy! All you need to do is simply sign the Township waiver and the rest is up to you. For your convenience, below are links to the Lower Merion Waiver. If you complete the PRINT version, please bring it to the event. For more information regarding volunteer opportunities, contact the Friends at info@cynwydtrail.org. In addition to volunteering outside, we also have many opportunities. We also have opportunities in event planning, fund raising, communications, graphics, websites and many other operational functions. If you are interested in opportunities like these, e-mail us and we will get you involved. Need a way to work off your court ordered community service in the Philadelphia area or in Lower Merion Township, while giving back to the community? We can help. There is a lot of work that you can do on the trail to get your court ordered community service done quickly. We have flexible work arrangements and weekend availability. By working on the Trail, you can make restitution, while gaining a meaningful experience. Contact Chris Leswing, (Assistant Director, Building and Planning, Planning Supervisor) at CLeswing@lowermerion.org or email us at info@cynwydtrail.org.